However, cow’s milk has become a controversial subject in the past few years. Some believe we should not be drinking milk from cows for many reasons. For starters, some believe cows are not treated humanely. Cows are kept pregnant or lactating in order to produce milk. Some farmers inject cows with an additional dose of rBGH, recombinant bovine growth hormone (a synthetic hormone injected into cows to produce more milk). Europe, Canada and Australia prohibit the use of this rBGH. Some have environmental concerns. For example, excess cattle grazing pastures places a burden on land. Also, the gas (methane) released by cows is said to contribute to global warming. Some people just believe it’s not natural to drink another mammal’s milk. Others are against the process of pasteurization and homogenization – questioning the point of drinking milk if it is not in its natural raw state. I simply choose organic cow’s milk because I like the taste, it lacks the additional rBGH, and the cows are fed a diet that has not been sprayed with pesticides. Organic cows are also not given antibiotics unnecessarily. Cow’s milk is a great source of calcium. Calcium is a mineral that is better absorbed in the body when Vitamin D is present. That’s why you see it as an added ingredient in most milk containers. Not only is calcium needed for strong bones and teeth, but it is also needed for proper blood clotting and heart rhythm. Naturally, we lose bone as we age. Some say after age 30, the destruction of bone is higher than the production of bone. So, having a good foundation before 30ish, is important. Mostly women after age 50 (post menopause) suffer from osteoporosis – significant weakening of the bones. Hormones (especially the lack of estrogen post menopause) also play an important role in this weakening. The key to preventing bone destruction is Calcium, Vitamin D (which you can get from hanging out outside daily) and exercise (which you should be doing daily anyways). Some studies have found other factors that lower the risk of osteoporosis: limit caffeine, colas, and retinol (perforated Vitamin A). Other cow milk products rich in calcium include yogurt, cheese, cream, ice cream and butter. Note that yogurt contains active cultures (bacteria) that are good for our intestinal flora. Most of these dairy products are high in saturated fat, so be mindful when choosing these items daily. Some people can’t tolerate cow’s milk physically – causing gas, cramps, bloating and diarrhea. This is because of lactose intolerance – they cannot digest lactose, the sugar in milk. Some milk products, like Lactaid, are made with lactase, an enzyme that breaks down the lactose before you drink it. 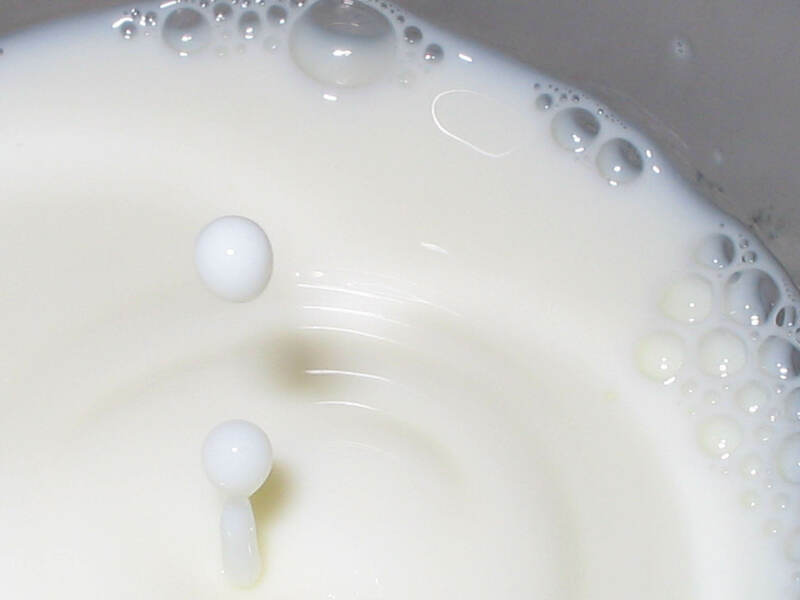 Lactose intolerance increases with age and is very prevalent in the elderly. Reason being – lactase production decreases after we wean from mother’s milk. Lactose intolerance is also prevalent in some ethnic groups (due to genetic traits). For example, over 75% of Asians, Africans and Native Americans are lactose intolerant. About 50 to 75% of Hispanics, Indians, French and Ashkenazi Jews are lactose intolerant. There is a difference between intolerance and allergy to milk. An allergy causes all the same symptoms as lactose intolerance plus skin rash, swelling in lips and throat as well as trouble breathing. People who are lactose intolerant or allergic to milk or oppose cow’s milk altogether choose other milk-like products. These products are man-made, processed and usually have additives, sugars and preservatives to enhance its taste and nutritional quality. For instance, soymilk is non-dairy, plant-based drink that has fiber and iron naturally. Another benefit of soymilk is that it’s low in saturated fat. However, soymilk naturally does not have Calcium and Vitamin D. These nutrients are added to mimic the nutritional quality of cow’s milk. This is true of most milk alternatives (i.e. almond milk, coconut milk, rice milk, etc.). If you choose soymilk, chose an organic one to avoid GMOs (genetically modified organisms) and hexane (chemical used in soy processing). Make sure to look at the label and note the additional ingredients used to fortify its nutritional value (like calcium, vitamins, etc.). Also note the additives (like sugar, preservatives, etc.) to enhance its flavor. The longer the list of ingredients, the farther away it is from its natural source. Natural is always better than processed. Another alternative is almond milk, which has vitamins D, E and A, as wells as calcium. It has a nutty taste and is good for your skin and has no saturated fat. If you like the creamy sweet taste of cow’s milk, you’ll like coconut milk. Coconut milk does not have many notable vitamins and minerals besides manganese. However, it is high in saturated fat. All kinds of milk are great sources of different nutrients that are good for you. It’s all about preference and physical compatibility. They all have distinctive tastes and textures that you may or may not like. Whatever you choose to drink, remember this mantra: Everything in moderation.